What? You didn’t pre-order one, but now your skin cries out to be covered in Stank? Well then, click here and let your body be covered in Siglerism. And feel free to post images of you wearing the T-shirts in the comments, but BE WARNED: we may select you as a model for our store page. Oooh ooh ooh ooh ME WANT! 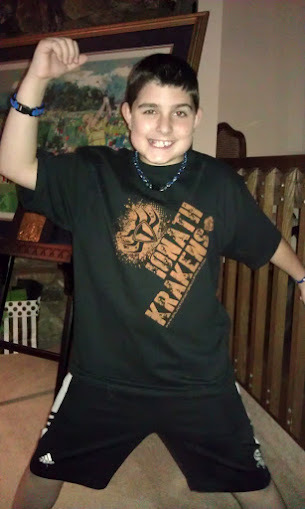 Here’s a pic of my nephew and future Krakens QB posing in his new tee. Don’t worry I will most definitely wear one and wash one and wash one and wear one. Got all four of them today. Better quality than I expected, especially for the price. I might let my wife wear one of them, if she’s nice to me. OD tee arrived today …. now i have too much football related stash to wear to uni… people beginning to think I have a one track mind! Um… eewww! Maybe wear one, wash one??? These tees are so comfortable I’m never taking them off. Hit up media (at) scottsigler.com – your question will be attended to. Krakens arrived today but no orbiting death… Does anyone know if they are sent separately even if they were on the same order… Or failing that who I need to query? Ps awesome job on the Krakens tee! Im 6,9 foot and really skinny. 81 kg so any advise? 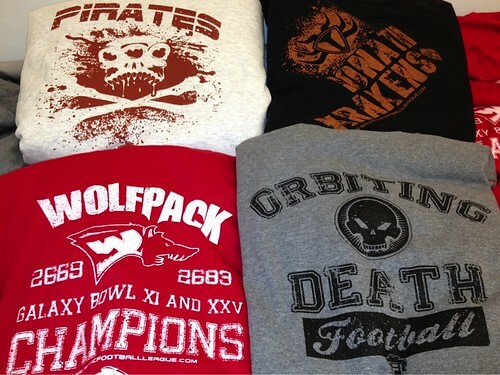 Got my Orbiting Death and Wabash Wolfpack shirts on Friday. They are glorious! Should be completing the set soon. Are more team shirts planned? Probably based on how well these sell right? So I typed the URL from the bottom of the t-shirt in aaaaaand…it goes nowhere. This is cruel! It’s like going to a Q Barnes BBQ but I’m not allowed to eat the big burger! Noooooo! Received mine this past Friday and they’re awesome, THAT’S WHAT I’M TALKING ABOUT! Great job to every that was involved from the designs to the packing and shipping. 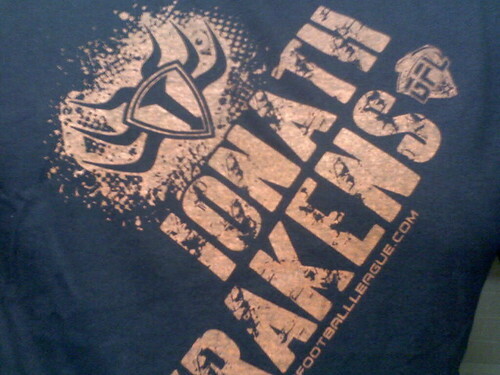 Now I can’t stop picturing what the other tier 1 and tier 2 team logos might look like on t-shirts. Pondy, why do you have to ruin all my fun?! I hope mine arrives today. Can’t wait to sport more GFL gear. Once I get the cash… I’m getting the Wolfpack one…. And as I am walking in the door to home…I notice a box sitting at my feet. Well, what is this I wonder. Hmmm, *shakes box* it doesn’t sound like there’s much there, let’s open this sucker. OMG, its my tshirts!!! I am going to sit here and fondle them for the evening, go away now junkies, we need some alone time. My Kraken’s shirt arrived today, and I have to wonder if it’s actually a triangle – my body won’t let me take it off! Got my Krakens shirt in today. I may have to buy at least one more. THey are so sweet. Thank you Scott Ponds!!! Oh yeah, check it out! Go Wolfpack! Thigh-high boots cover part of my legs … don’t they count as pants? For the love of all things unholy, please make sure you wear pants in any tee pictures posted! Or at least pose with a barstool and a hula-hoop if you must. My order is in! If I still played flag football I would have the team be the Orbiting Death and have overyone on the team order them! I am going to be sitting here anxiously checking my mailbox every single day until they arrive. Must have tshirts! Yessss … take our free samples … try them, they won’t hurt you, and they are free, so they won’t cost anything …. yesssssss. No Ice Storm? … I’ll live, for now. Awesome! I ordered my Orbiting Death t-shirt last week. I also couldn’t stand to wait a week for the next audio episode of the The All-Pro, so I picked up the ebook too. I’m now about three chapters ahead of the audio book.